Hurricane Maria is classified as the 10th most intense Atlantic hurricane in recorded history, hitting Puerto Rico on Sept. 20, according to a Sept. 20 article on Weather.com. Hitting two weeks after Hurricane Irma, it has created a humanitarian crisis in Puerto Rico. The official Puerto Rican death toll from Hurricane Maria stands at 54, but the mayor of San Juan says the number is closer to 500, according to a Nov. 3 article from The Hill. The storm left almost all of the island without electricity for several days and 3.4 million residents in a state of emergency, according to the U.S. Department of Energy . Distant as this situation of chaos may seem to some, there are students on this campus who are directly tied to Puerto Rico. The great majority of the families of the Puerto Rican students at Tufts are currently on the island and were there during the hurricane. Their lives have yet to return normal even a month after the hurricane passed. As of Oct. 11, only 16 percent of the island had electricity and 40 percent of the population was still without access to clean, running water according to a Chicago Tribune article. Since the Puerto Rican students were completely cut off from communication with their families for several days, the only information they received was from the news or social media. Sophomore Alfredo Gutierrez, a student from Puerto Rico, explained his situation. “I couldn’t speak to my parents for 10 days after the hurricane passed, and when I finally spoke to my mom, she was crying saying it was a disaster, as if a nuclear bomb had landed on Puerto Rico,” Gutierrez said. Similarly, after not communicating with her parents for a week, first-year Puerto Rican student Carolina Soler described her new perspective from the experience. There were shared feelings of stress and anxiety amongst Puerto Ricans, because the hurricane shifted its path and the eye passed through more of the island’s territory than expected, according to first-year Patrick Beliard, a student from Puerto Rico. There were many people who were hit harder than they prepared for, according to the New York Times hurricane tracker. After the storm passed, Puerto Rican students who were not on the island felt completely useless to help their families and friends on the island face the reality of post-Maria Puerto Rico. Beliard described accepting that the Puerto Rico they left is not the same one to which they will be returning. Puerto Rico has been receiving aid from the federal government according to Puerto Rico Governor Ricardo Rosselló in an Oct. 1 CNN article. Even though there is a great feeling of gratitude from the governor for this aid, the damage on the island is much greater than can be repaired with the amount sent. 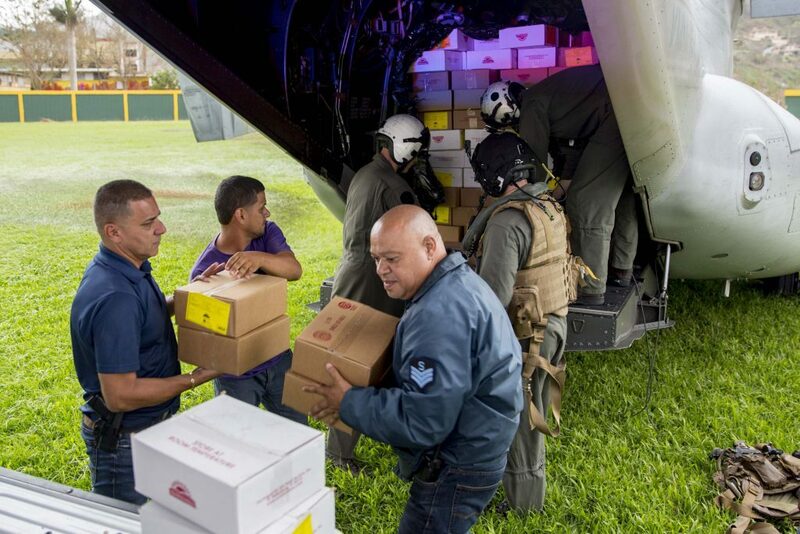 Puerto Rico has received a small fraction of the amount of aid that was provided to Texas after Hurricane Harvey or Florida after Hurricane Irma according to an Oct. 6 Bloomberg Markets article and an Oct. 2 Politico Magazine article. “I see this difference in aid as an act of racism,” Gutierrez said. If Puerto Rico could import goods and aid from other countries, their dependency on the United States wouldn’t be a problem. However, given its position as a commonwealth, they must follow the set of laws known as the Merchant Marine Act of 1920, also known as the Jones Act. This set of laws requires goods shipped between points in the United States to be carried by vessels built, owned and operated by Americans. The Jones Act was temporarily waived on Sept. 28 for 10 days, according to a Sept. 28 New York Times article. “There were many nations who wanted to help, but they weren’t allowed to take their supplies to Puerto Rico. It had to be through a U.S. ship. Moving towards the 21st century, it is another reason why the cabotage laws just don’t work,” Beliard said. According to the students interviewed, Hurricane Maria and the response of the U.S. government have further complicated the debate on whether Puerto Rico should be a U.S. state or an independent nation. They described how now it is even more challenging to be a radical on either side of the spectrum. In an Oct. 3 CNN video, Trump can be seen in Puerto Rico, distributing supplies such as paper towels, throwing them as if they were basketballs rather than handing them to the crowd. According to Gutierrez, the way President Trump has acted toward Puerto Rico has made Puerto Ricans feel less enamored with the idea of obtaining statehood. “Definitely there is more hatred towards Trump than ever before in the island,” Gutierrez said. There was a strong sentiment of exasperation from the lack of seriousness on behalf of the president in an event that was intended to be empathetic, Soler explained. The students interviewed stated that supporting the other side of the spectrum, backing full independence, has become less popular as well since Puerto Rico is in a situation it couldn’t get out of without the United States, given its economic situation. Before the hurricane, Puerto Rico was already in a $123 billion debt according to a May 9 article from The Intercept, and according to CNN Money, it will cost them more than $100 billion to recover from Hurricanes Harvey, Irma and Maria. Gutierrez believes that while the people of Puerto Rico are accepting their dependence on the United States, they are in a middle ground where they aren’t benefitting fully from any side. “This has been a wake-up call for Puerto Rico, to realize how much of a colony we are, or not even a colony, and we’re being exploited,” Gutierrez said.